Editor's Note: This article was submitted by the McGraw Central School District. 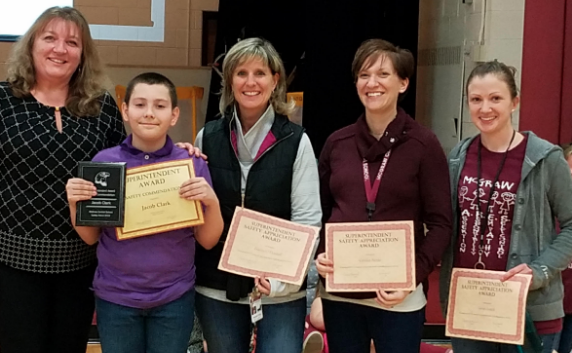 McGraw Superintendent Melinda McCool honored the elementary school Safety Patrol Teacher advisers and Safety Patrol Jacob Clark Friday afternoon at the monthly Friday Finale Character Education Assembly. Jacob was awarded the "Superintendent Safety Commendation" for exceptional performance of his Safety Patrol duties. The teacher advisers train the older students in the school to assist with crossing students at the elementary school in the morning and at dismissal. Students stand at either end of a crosswalk as teachers advise and direct traffic. A few weeks ago while Jacob was on duty, he held his arms out as instructed to prevent students from crossing while a car was slowly moving through the intersection. Although all students had stopped behind him safely as they are used to doing, a younger student slipped away from a parent and attempted to slip under his arms as he blocked the pathway. Without missing a beat, Jacob quickly reached out and pulled the youngster back to safety. As Superintendent McCool shared his story with the entire school today, the entire elementary school cheered as his proud parents looked on. Students were heard singing his praises as they left the gymnasium. Students were heard sharing with one another, "Jacob is one of my best friends!" and "I'm his cousin:"Congratulations to Jacob Clark for his quick thinking and heroic actions. McGraw Elementary celebrates the exceptional role model that you are for your peers.